Starting off as an independent music software company in Atlanta, GA., Blue Ribbon Software created a couple of engines geared for helping composers create music for the huge wave of multimedia production in the past decade. With products like Super Jam and Audio Tracks Pro they formulated a method for generating seemingly infinite variations of music based on a handful of musical components including orchestration, harmonic modes and rhythmic patterns. Together with a technology that allowed the Midi stream to be rendered with high-quality instrument samples on output, this combination made them an attractive addition to the Microsoft universe. The original intent of what has become DirectMusic included applications for the internet, educational products and game titles. The technology addresses issues of asset space, download bandwidth and quality consistency. But beyond the commercial applications of DirectMusic, and it's authoring environment DirectMusic Producer, a whole new approach to composition is featured. This approach focuses the composition process on the basic elements of a piece and then allows for instantaneous variations of those elements to be used in a final product, whether that be linear or dynamically changing. DirectMusic Producer fills a need for interactive music and the production thereof no matter what the end use. This environment is great for game composers, but could find its way into the creative tool belt of anyone writing music with a PC. Upon examining a fresh install of DirectMusic Producer (currently packaged with the DirectX developer's kit, ver.7 beta 1), many of the modules have a familiar look and feel. The main window features a track overview of typical sequence components such as tempo, time signature, and the various instrument tracks; but there are also tracks dedicated to chord movement, patch change groupings and system exclusive data. 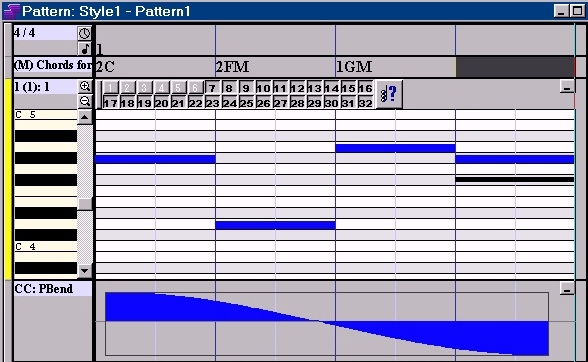 (see figure 1) This segment editor is where imported Midi data can be viewed, edited and assigned to either a selected General Midi synthesizer or custom instrument samples. In this simplest form, DMP performs like a typical sequencer with the added advantage of Midi and sample playback requiring no additional hardware other than the audio output (DAC) of the computer. The use of the DLS (downloadable sounds) standard and compatible software synthesizers is one of the two main features DirectMusic brings to the world of PC game audio and computer music in general. In the past, computer-based game music has always relied on the hardware synthesizer installed on the sound card. The advantages for musicians meant that there was always a base-level General Midi synthesizer available to write and play music with. The disadvantage was there was never a guarantee that the playback would sound the same from machine to machine. Wavetable synthesis, both in hardware and software, increased the probability of higher quality playback but there was still the consistency issue. With downloadable sounds, a Midi performance in DirectMusic or other suitable playback engine can be shipped packing it's own custom sample instruments, or opt to use the default DLS set, OR a combination of both, balancing unique sound with asset economy. This flexibility affords the DirectMusic composer tons of options, similar to that of working in a big, professional studio. First of all, DMP comes with the Microsoft Software synthesizer containing the Roland licensed instrument set. Next out of the gate is the Yamaha SYXG software synthesizer that is not only DLS compatible but brings with it all of the synthesis parameters found in the XG specification. There will be more third-party synthesizers and sample sets available in the future, to be sure. In the configuration window of DMP, you can create a set up addressing any one or more of the available synthesizer engines (figure 3). This window also shows the various features and abilities that are available for each synth. Other synths, like installed hardware cards and external Midi gear can also be configured into the set up for composing but will have different timing latencies than the software synths. This is hand for realtime Midi entry and performing new data to earlier tracks. Unless the synthesizer (soft or hard) is DLS compatible, it will not support custom sample instruments. So these fulfill the synth rack side of our virtual studio. On the sampler side, DirectMusic Producer provides an entire set of tools for creating instrument sets from the basic wave files. To use the built in DLS editor in DMP, first you create a DLS set in the "explorer" window to the left of the main segment window (figure 1). This will give you two sub-directories called Instruments and Waves. By right-clicking the Waves directory, it allows you to import your custom samples whether they are individual instrument files to be used in a multi-sample key map or longer phrase samples that can be looped to add ambiance similar to the Mod file format. Once the samples have been integrated into the Wave section, they become available in the Instrument editor. Again, right-clicking on the directory icon allows you to create a new instrument. 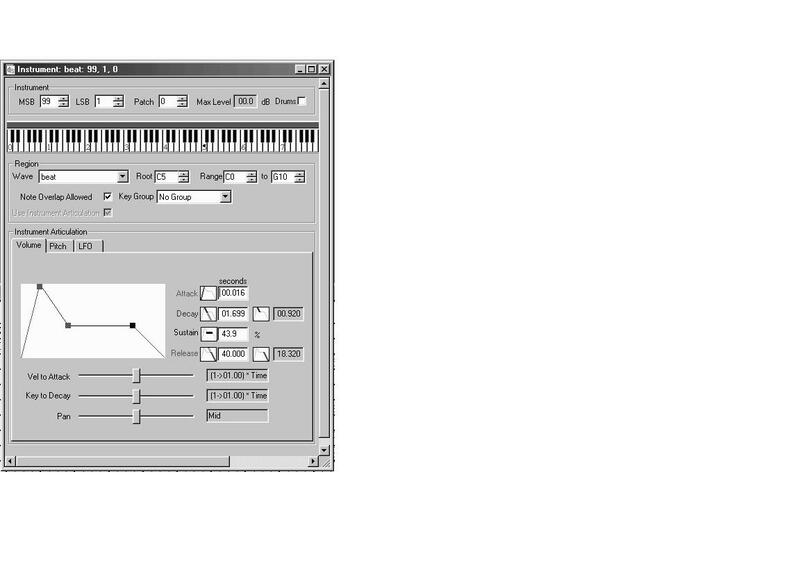 Clicking on that instrument gives you the instrument editor itself with all the editing parameters found in hardware sampling utilities or such programs as Sample Cell for the Macintosh. Familiar features include regions, range, LFO, and ADSR control of both volume and pitch (figure 4). Between the preset General Midi synthesizers available, and custom sampled instruments that you can cook up yourself, DirectMusic Producer really delivers a virtual studio for musical composition and playback. But wait, there's more! When it comes to "interactive music", the people of the DirectMusic team at Microsoft are intent in making this a household (or at least desktop) concept. The basic approach to this form of non-linear musical experience is the Style and Style Editor. A Style, as depicted in the explorer column in the main window (figure 1), is comprised of three different kinds of elements. They are Bands, Motifs and Patterns. The Pattern editor is the central work area for creating Styles (figure 3). This is a kind of mini-sequencer that allows for recording real-time directly into the editing window. The notes show up as piano roll information or traditional notation. Also available is a continuous controller track for entering or drawing in information for pitch bend, volume, pan, etc. Here's where the differences start to show up. In each pattern, the composer is able to create multiple versions of itself. By selecting the little numbers above the piano roll, performance data can easily be created and shared between patterns. These patterns can then be called up as randomized modules thus creating an infinitely non-repeating musical texture. They also can be conditionally weighted for appropriate accompaniment in a game environment. 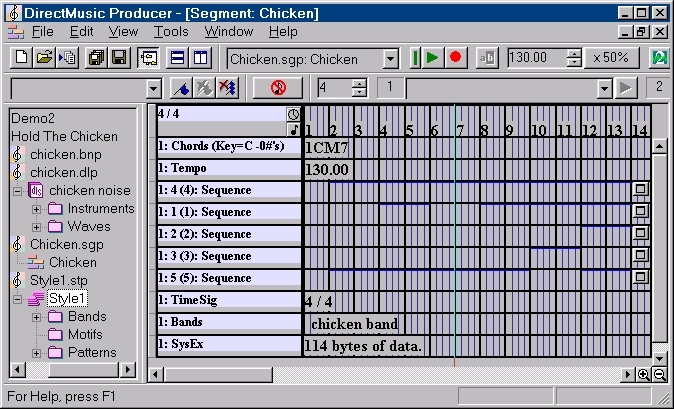 Another major departure from the typical sequencer model is the chord track. Prominent in both the Segment and Pattern editors, these are another form of variation used for getting even more mileage out of a common sequence. By setting the chord parameters of a pattern, multiple variations can be performed based on key and mode, while maintaining the basic rhythm structure of the original pattern. The second Style element using notes is the Motif. This is a sequence that is used as a brief flourish, an intro, or an ending. Given the textural nature of the Pattern, the Motif provides musical gestures of a potentially non-repeating nature, giving even more diversity and expression to a DirectMusic experience. By crafting a limited number of Patterns and Motifs, together with an engaging chordal map, there is a lot of music that can be generated from such a small amount of data. This is one of the critical features of the DirectMusic concept. The third Element of Style is the Band. As mentioned before in the Segment window, contains a collection of patch changes that draw from the DLS set. This could be a General Midi configuration of the standard 128 instruments, any number of custom sample instruments, or an exotic combination of both. Used in an interactive scenario, a swap in Band can greatly affect the variation of a given Pattern or Motif; say switching from a marimba band to a swing band, or more drastically a collection of duck samples. The Band addresses any number of DLS sets, which are comprised of various instruments, that are in turn built up from different wave files. A simple change in band can have both subtle and drastic effects within a style. Some of the techniques composers use in working with Midi not only are applicable in DirectMusic Producer but also are given new function considering the structure of the DirectMusic. The growing number of external Midi controller panels, such as the Keyfax Phatboy, allows for a gestural manipulation of Midi controller information that can be recorded directly into the Pattern editor. This would allow you to create patterns with similar note activity but wildly varied performance nuances. For the coming number of DLS synthesizer that support both custom samples AND Midi controlled synthesizer parameters, this opens up more playback possibilities than one might come up with in a traditional studio situation. It should be noted that recording into the DMP Pattern editor is greatly enhanced with a "drum machine" style of loop recording. As mentioned above, the control parameters only make a difference when played through a synthesizer that responds to such commands. The Roland GS and YAMAHA XG specifications and the synthesizers that support it typify this extended set of features. In DMP's configuration window (figure 3) the appropriate X behind the listed software synthesizer notes the support for these features. Again, configuring for more than one synthesizer engine increases the possibilities for creative expression. Another approach to working in DirectMusic producer is from the standpoint of totally original DLS sets. A number of third party companies are making full General Midi and XG sample sets available specifically for use in DLS. The DLS set used for a piece or shipped with a game title can lend as signature a sound as a recording artist's choice in a particular instrument. But the most individual use of the DLS features is in creating fully produced phrases of music to be used as loops or motifs. Being that a sample can contain any number of instruments, high-quality interactive music can be constructed from a small number of samples and then programmed to give an extended musical experience by re sequencing and remixing the sample playback. This is the sort of thing such applications as Sonic Foundry Acid and Digidesign ProTools are most known for and with just a little bit of clever file conversion, Acid and ProTools can in fact be used for preparing audio snippets for use in DirectMusic Producer. Using the "save waves at project tempo" feature in Acid ensures that all of the waves will synch together when called up from Midi data in DMP. Once this "Mod file" technique becomes more popular, it will not seem unlikely that new utilities and save features will popping up like flies. Of course every good composer will use a new tool in different ways. Sometimes in ways that even the developers couldn't predict or imagine. The nature of the pattern variations and motifs in an interactive environment could place DirectMusic Producer very comfortably in an experimental theater or dance performance. Configuring the synth output ports to use both custom DLS samples and external Midi gear would provide a very formidable musical environment for such a presentation. Experimenting with an application as complex and versatile as DMP is worth more than the same amount of time pouring through the documents that come with the application and the DirectX software development kit. Music, after all, is still a creative activity. Even from the world of Microsoft! Copyright © 1994-2016 MIDI Manufacturers Association.